When it comes to birds and the variety of species in that family there is no restriction to look through and know about the beautiful creature on the internet. Penguins are one amongst the most elegant birds. They are found in the southern hemisphere near South America to Antarctica. These amazing flightless social birds are found in different forms with the likeness of black back and white front. 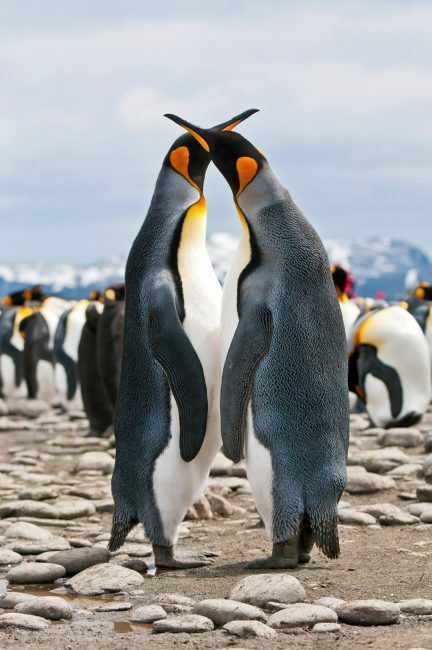 Chinstrap, Emperor, Adelie, Magellanic, Southern Rockhopper, Humboldt, King, Gentoo, and Icadyptes penguins are the types of penguins which have certain distinct features from the same family. Here let us see about the birds that are similar to penguins. Auks are a species of bird which are very similar to the penguin clan. It comes under the Alcidae family and it is also called as Alcid. They can fly under water and also fly in the air, unlike penguins. There are 21 living Auk species. They are similar to penguins with the upright posture. They are 15 to 40 cm long but the Great Auk measures about 75 cm long. They have short limbs and legs and also webbed feet similar to penguins. Their walk is as similar as penguins unwieldy walk. They eat plant portions, mollusks, insects, crustaceans and, fish. They are found in the northern arctic seacoasts. Also few species can be found in Baja California. They nest in cliffs, rock crevices or burrows close to the sea. They mostly depend on fishes for food. During winter they stay far-flung from the land. Though the great auks are flightless, the living species can fly. Murre is a type of auk that bears a resemblance to penguins. There are two types of murres, one is the common murre and the thick-billed murre. They are found in the northern oceans. Murres are 40 cm long. They have the black and white body combination. They have webbed feet and short wings and legs. The thick-billed murre has heavier beak when compared to the common murre. During the flight, they make a murrr sound and stays silent at sea. They are highly sensitive to boating and aerial disturbances. The thick-billed murre nests in the north side within the arctic circle. They also nest commonly in some islands. They nest on cliffs, burrows and rock crevices. Penguins and puffins are similar in looks and share the same colors and intake. Puffins belong to the family Alcidae. They fly unlike penguins because of their hollow bones. The solid bones make penguins the better swimmers. They are small in size and measures about 10 to 15 inches. They have short legs with webbed orange feet and thick pointed beak. Their wings beat rapidly during flight and stand erect when they are on land. They can carry quite some small fishes in their beak. They make a loud growling sound. Some species of puffins live in northern hemisphere whereas some species live in the southern hemisphere. There are three species to name they are, horned, Atlantic and tufted puffins nest commonly in the offshore islands or isolated northern coasts. Live in burrows, rock crevices. Horned Puffins- Can be differentiated by the yellow bill with orange tip beak. Atlantic Puffins- Can be differentiated by the steel-blue triangle at the base of its beak. Tufted Puffins- Can be identified by the long, straw-colored feathers. Guillemot is a medium-sized Alcid similar to penguins. There is also a black guillemot which will have maximum black body coloration. The guillemot comes in four different species like pigeon guillemot, black guillemot, Kurile guillemot and spectacled guillemot. They have a black body with a white wing patch, a thin dark bill, and red feet. They produce a high whistling sound. They can carry the fish in its beak for long hours. They also swim easily under water for food. They eat fish, water plant portions, mollusks, insects, crustaceans. They live in rocky shores, cliffs, and islands on northern Atlantic coasts of northeastern America. Booby is a seabird from the Sulidae family. The name is from the Spanish slang bobo and they commonly land on sailing boards. They have often been caught and eaten by the sailors. There are different types of existing boobies. Brown booby, Blue-footed booby, Red-footed booby, Nazca booby, masked booby and, Peruvian booby. The red-footed booby, brown-footed and masked booby is found mostly in worldwide tropics. The Peruvian booby is found from Ecuador to Panama. The Nazca booby is found from the northern Pacific to Alaska. The blue-footed booby is found from the Gulf of California to British Columbia and Texas. The boobies eggs are blue in color and chalky in texture. When they dive deep into the water their facial air sacs protects them from the effect. They are 80 to 90 cm long. It has long pointed brown color wings. The neck and head of the booby have brown streaks whereas the underside is white which makes the similarity with the penguins. The brightness of the blue feet diminishes with the age of the blue-footed booby. Their long beak can hold plenty of small fishes. Also, they eat squid and offal. It can also easily swim underwater in search of prey. They dive from a height to go deep to get their prey in the underwater. They live in the tropical or subtropical islands of the Pacific Ocean. They can be found mainly from the Gulf of California to South America down to Peru. They nest in trees, rock niches, and cliffs. Razorbills are a type of seabirds that come under Alcidae family. This bird chooses one partner for life and the remarkable characteristic of the female is that it lays one egg per year. The head of the razorbill is darker when compared to the common murre. They are quite identical to common murres. The male and female razorbill share the major similar looks and features. They are 7.9 to 8.5 inches long. They nest in coastal places, crevices, cliffs, and boulders. They are found vastly in the North Atlantic. One more special characteristic that the razorbills hold is that the male and female take turns in incubating the egg every single day. Auklets are the small seabird of the auk family Alcidae. Whereas auk is any of the quite a lot species arctic seabirds of the family Alcidae. There are different types of auklets. Cassin’s auklet– It is vastly found in the north Pacific. Nests in small burrows. Parakeet auklet– This auklet is found in North Pacific. Parakeet is a unique seabird with circular gills. They usually nest in the same place of least auklet and crested auklet. Crested auklet– This auklet is a chunky seabird found in the Northern Pacific and the Bering Sea. They dive deep into the underwater to find its prey. They eat small marine animals and krill. Whiskered auklet– This species is more restricted in living and live only in the Aleutian islands. It is similar to the least auklet and smaller than other birds in the alcid family. Least auklet– This auklet is found abundant in North America and Siberia and also over the world. It is a smallest in the species of Auk. Rhinoceros auklet– This species of auklets are closely related to the puffins. They are mostly found in the genus Cerorhinca. They are found in medium size with dark gray, apart from the white belly. Murrelet is a North Pacific seabird which is comparatively small to that of a murre and they are present in the North Pacific islands. They have a gray, black back and wings and white underparts. They are in the form of the following species. Marbled murrelet: It is a small seabird in the auk family and found in the north Pacific islands. Murrelet nests in the higher latitude places where trees are hard to grow or in the matured forest trees. It is a chunky auk with the slender bill. This coastal bird is found within the saltwater region of 1.2 miles of shore. This marbled murrelet is suspected to be globally endangered species. Long-billed murrelet: Long-billed murrelet is similar in characteristics with the marbled murrelet and the kittlitz’s murrelet. Also, they are widely found in the North Pacific islands and nests in the old forest. The size of this murrelet is small about 25cm long with pointed wings. It can migrate more than the marbled murrelet. And they feed on small fish. Kittlitz’s murrelet: This is small murrelet like other murrelets and found in the waters off Alaska and Siberia. They have their nesting in the mountaintop. Kittlitz’s murrelet is determined to be similar to the marbled murrelet. Also, this murrelet measures about 25cm long. This species of auk is also termed as one of the endangered murrelets like other murrelets. Although penguins, auks, murres, and puffins share similarities, the family of penguin is different from the other seabirds that resemble them. The penguins come under the family Spheniscidae. Apart from the species that exist, scientists discovered over 40 species of extinct penguins. It is believed that about 65 million years ago the Penguins deviated from flying. The reason behind the change was found to be the oceanic environment where they were more into diving and swimming. Thus the structural changes led to the flightless adaptation. The prehistoric penguin’s region is restricted to the southern hemisphere as the present penguin region. Penguins have molecular and morphological characteristics similar to other birds. The great auk is the species of flightless alcid which resembles penguins majorly but not penguins. Great auk became extinct in the mid-19th century. The great auk was 75-85 cm long and the black back and white belly front resembled the penguins. They develop a white patch around the eyes during summer and in winter these patches tend to disappear. The great auk and penguins are flightless birds but the other species similar to penguins such as auk, auklets, murre, murrelets, puffins, boobies are birds that can fly. In general most of the bird enthusiasts assume that all the webbed feet birds, with white belly, are related to penguins. But the spectacular characteristics and features make the bird lovers search for their history and living. Auk, in general, is not a flightless bird but the extinct great auk is one which cannot fly. The remarkable and mighty birds are anytime a surprise of knowledge for us to know about their biographies. Every one of us should save the penguins and birds to hear nowhere about their extinct in the impending!